Rarely do I enter a challenge twice in a week, I did however happen to make two Monochrome cards so what the heck right!! 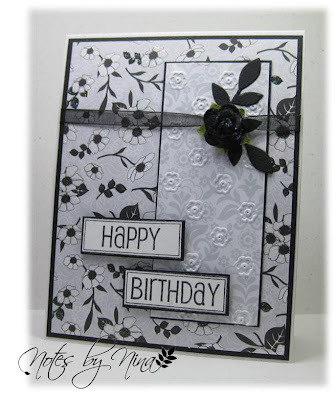 So this card is also for the Monochrome challenge over at Charisma Cardz Challenges. I love this paper, all the flowers have glitter on them that sparkles when it hits the light just right. 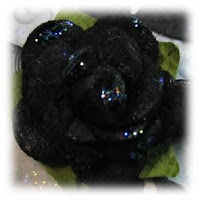 It took me many tries before I had a picture where the rose did not just look like a black blob on my card. It started out with more glitter but after I fussed with it over and over it fell off. I added a little testure on the panel. Supplies: Natural White and black cardstock, Designer Paper-Best Creation Inc, The Stamps of Life - Labels2use, Fairydust Glitter, Memory Box die cut, misc ribbon and Recollections rose. When my sister Barb and I get together to craft we usually try to find a card challenge to get the creative energy flowing. So we are trying a new to us challenge called Charisma Cardz Challenges!!! This weeks challenge is Monochrome. I had two cards to choose from but the other card has a black rose on it that I can't quite get to show up in a photo right sooo... this is the one to post for the challenge. I used Goosebumps on the butterfly then sprinkled it with Fairy Dust Glitter to match the glitter on the designer paper. I managed to get a nice closeup picture of the delicate butterfly wing with the glitter on it. 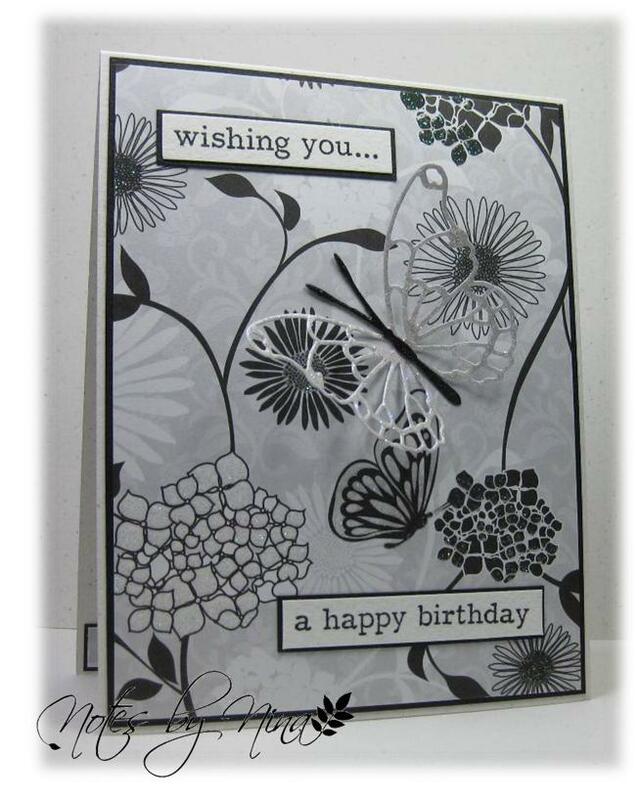 Supplies: Natural white and black cardstock, Designer Paper-Best Creation Inc, The Stamps of Life - Daisies2garden, Goosebumps, Fairydust Glitter, Memory Box die cuts. 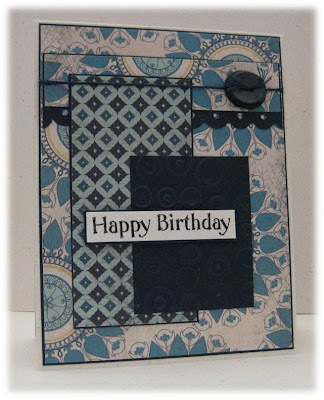 Take a peek at the card Barb created, comments are always welcome. Thank you for stopping by. I can’t believe that it is already the end of July, summer is in full swing and I love it. Alas, my vacation was over yesterday L I dragged it out till the very last moment though. For my Merry Monday Challenge card this week I am going to use the Sketch #17. I was crafting with my sister and I let her choose which sketch we were going to use, Barb posted her card a couple of days ago but I waited till I arrived home to download all my photos and post for the last Monday in July. Have you ever tried Goosebumps? I was introduced to this by a lady in one of the craft stores we visited in Kelowna, I could not wait to give it a try. 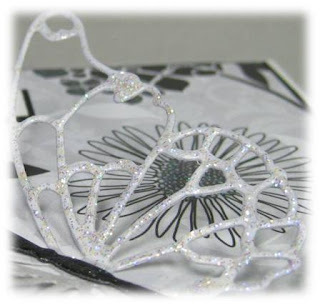 It is a spray on liquid that adds texture and sparkle once it dries on a project. I used is on each of these little ornaments. I took this picture in full sun so the sparkle would show, tried to take a closeup on one of the bulbs but my camera was having none of it. 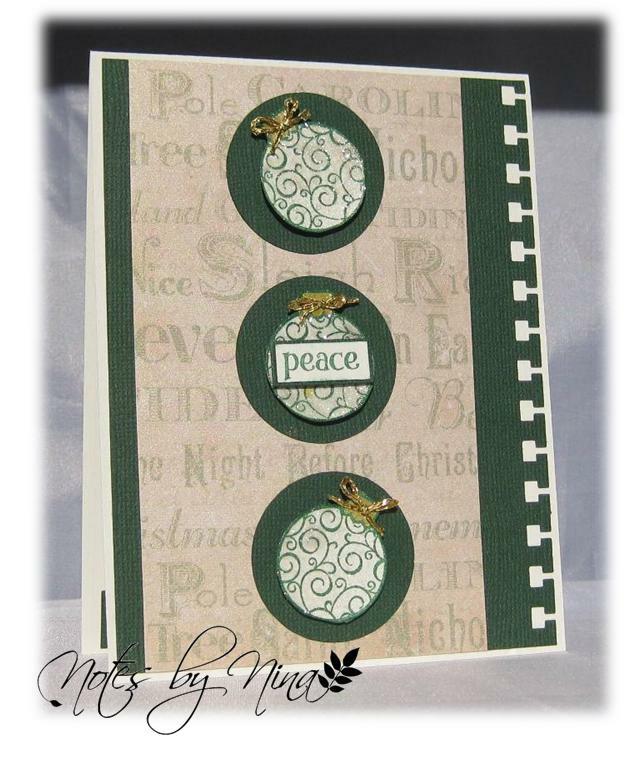 Supplies: Natural Ivory and green cardstock, Designer Paper - TPC Studio, The Stamps of Life - Holly4Christmas, misc gold twine, edge punch. Happy Friday everyone, Whoo hoo I have reached 50 followers on my blog, how exciting is that.. well maybe not so much for you but that made my day. I am still on my vacation but I did manage to get a little craft time in with my sister to get a few cards made. 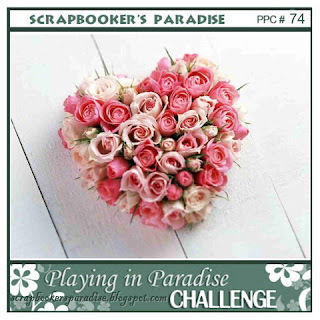 It is time for a new Playing in Paradise challenge; Allison has a wonderful sketch as our inspiration this week. I sure struggled with my card though, inspiration was quick but getting it all glued together and where I wanted it was a totally different story. Don’t get me started on my questionable photo J.
I love this beautiful designer paper that I snagged from my sisters stash. 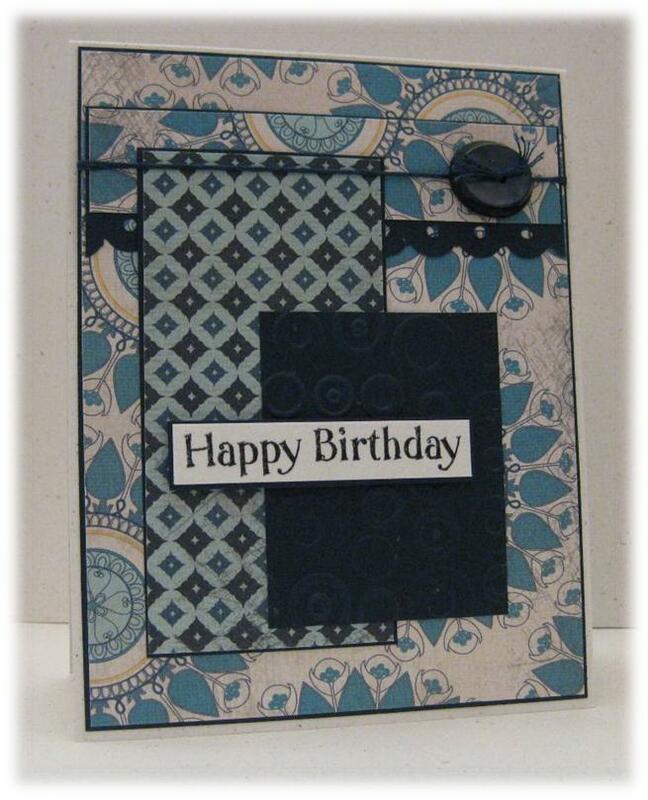 I created the card base, added a layer of DP, then punched the top section and added a strip of DP. The part I struggled with is where a focal image should be, I tried a good dozen things before I just used a textured piece of cardstock and added a layered sentiment on top. I finished with this fantastic button, again from a secret stash and some embroidery thread. Supplies: Natural White and navy cardstock, Designer Paper - Indie Chic , misc button and punch, embroidery thread. 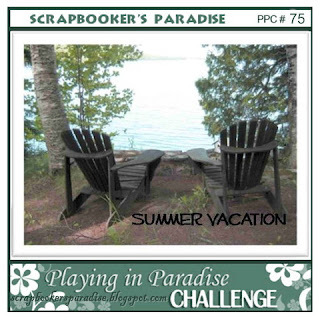 Stop by the Scrapbooker's Paradise Blog to see what the challenge team has posted for Playing in Paradise #77, join in the fun and you could win a prize. 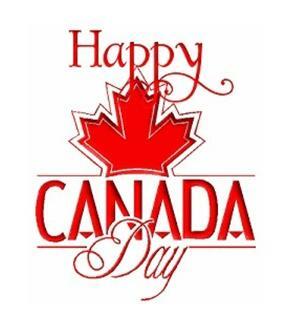 Sorry I have not been doing much in the way of commenting, I will sit down and catch up once I am back home. 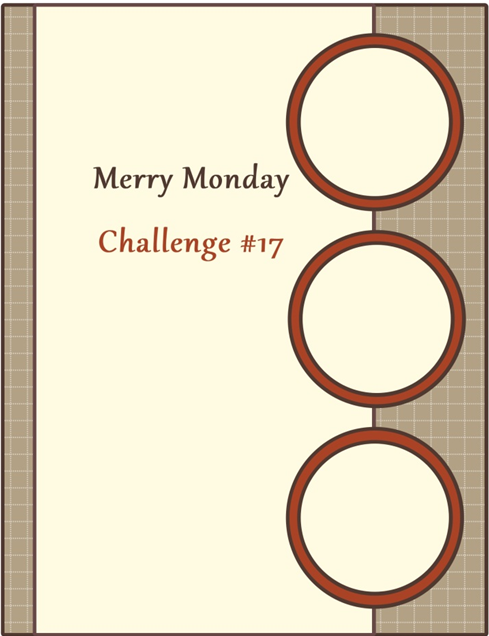 Merry Monday, this week I am reusing the sketch from challenge #10. I followed the sketch pretty loosely though and flipped it around. Lesley is enjoying a little time off for July so we are picking past sketches to create something new. 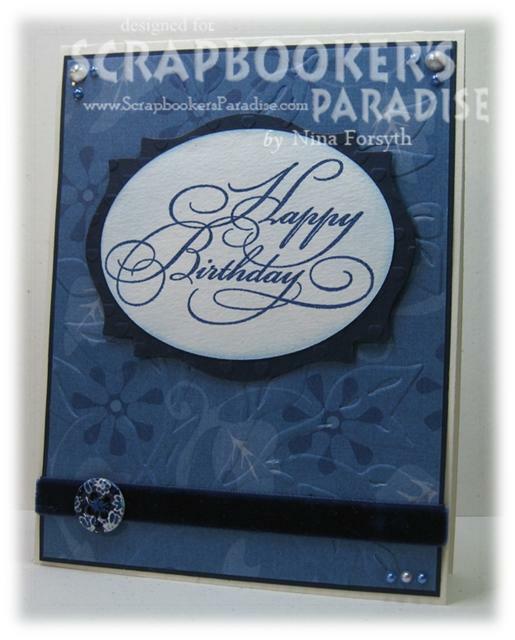 This fabulous stamp is from Scrapbooker's Paradise, I was torn between doing a vintage style card or colouring the image. I stayed with the monochrome vintage look for the first time around. I used an embossing folder to add some texture to the back ground, distressed all the edges a little for a faded older look. I finished with a old button and a mix of twine. Supplies: Natural Ivory and brown cardstock, Designer Paper – Graphic 45, Verve-Glad Tidings, Heartfelt Creations - Snowy Window Scene , misc button and twine. The other design team members and cardmakers have been busy creating as well stop by Lesley's blog to take a look. Happy Friday everyone, we have a new challenge for Playing in Paradise and Jessi is our hostess this week. The inspiration photo tells it all :). I used Velvet ribbon for my little bit of soft, the nice elegant ribbon always adds a little class to a card. 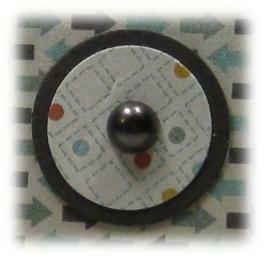 I used a printed button from my stash as an embellishment. The sentiment was heat embossed but I also used an embossing folder to add some additional texture to the background and sentiment frame. I finished with some pearls. Supplies: Cream and navy cardstock, Designer Paper-Scrapbook Walls, Close to my Heart - Gracious Greetings, velvet Ribbon, misc pearls, Spellbinders. Stop by the Playing in Paradise blog to take a look a the wonderful creations the challenge team has created. Play along with us for a chance to win a prize. I actually did a few colour combinations when I was playing, I thought I might as well make them into cards even if they are so simple. 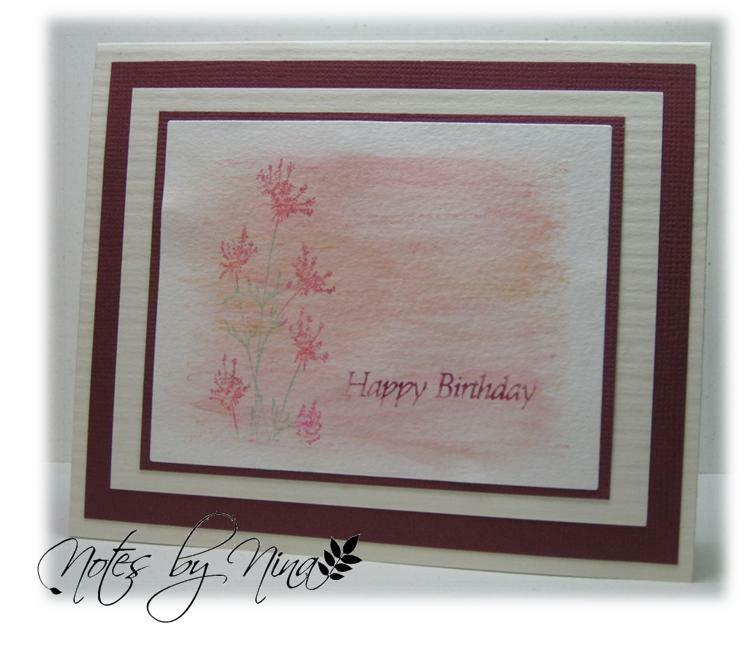 The background I created using watercolour crayons, the wildflower image is coloured with Tombows before stamped. 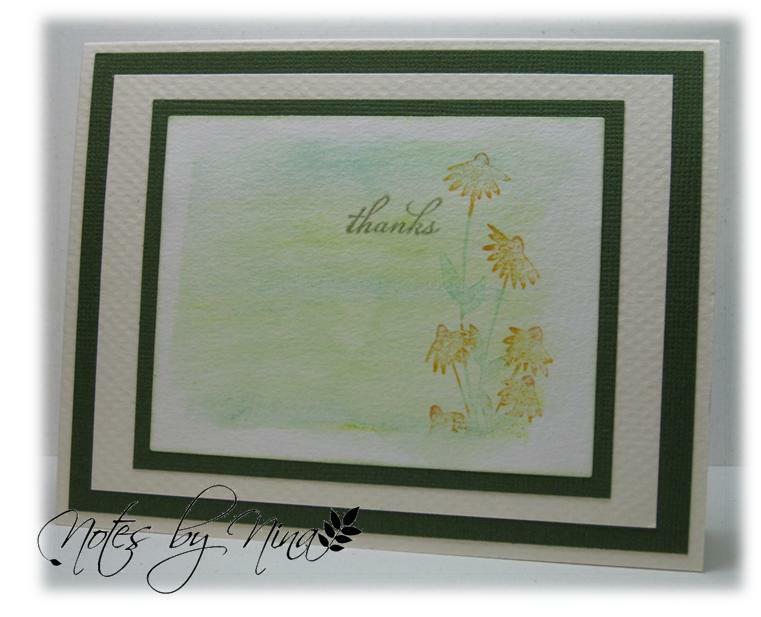 Supplies: Cream and green cardstock, Stacy Stamps - Solid Wildflowers, TPC Studio - Thanks. I am still playing with my watercolour crayons and I love how easily they blend. I used my Tombow markers on the wildflowers. I think the frame took longer to make than the image. 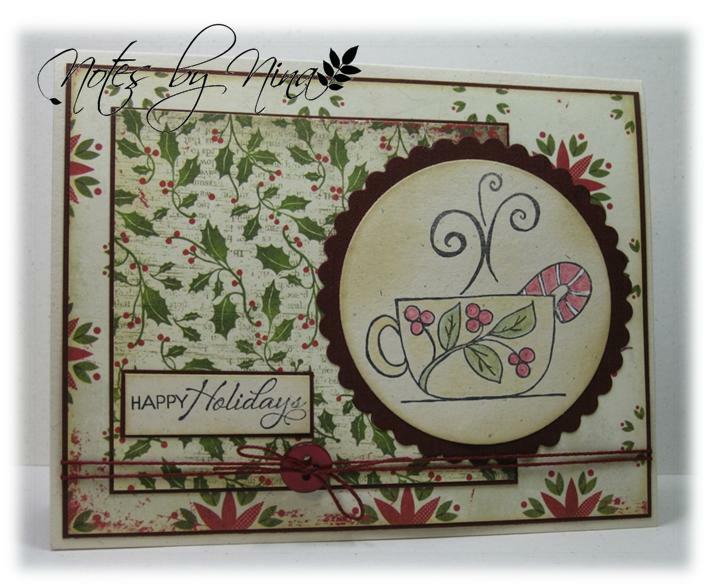 Supplies: Cream and burgundy cardstock, Stacy Stamps - Solid Wildflowers, Inspired by Stamping, - Ahoy Matey. 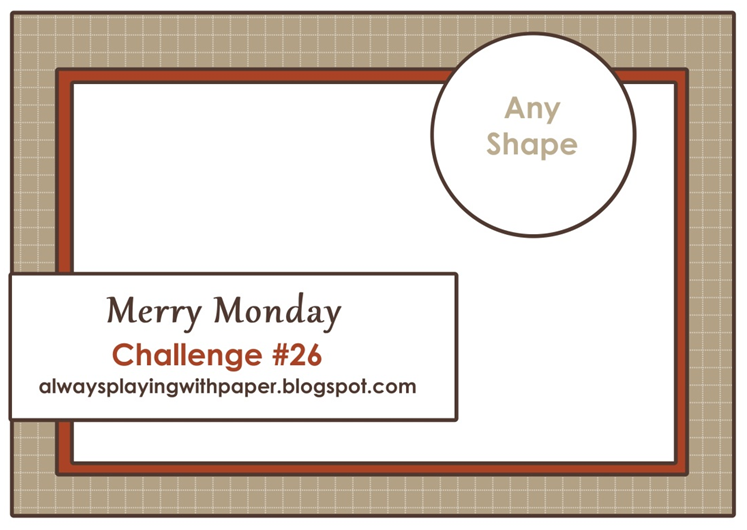 Happy Monday, I have a new and old Merry Monday Challenge card again this week. Lesley has shut down her computer for July so this challenge is running for the whole month. I created something new using the sketch from Challenge #4. 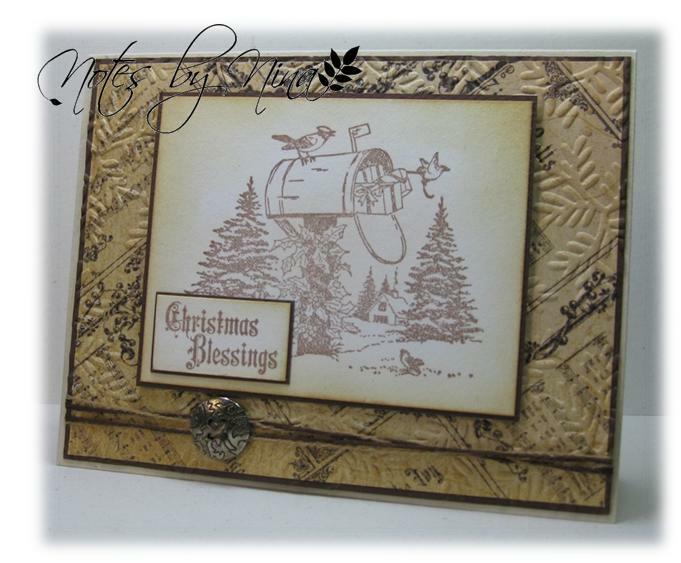 I was cleaning up some of my little nooks where stamps hide and I found this fabulous stamp from Stamping Bella. 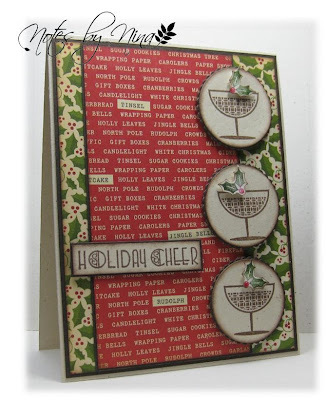 Supplies: Natural Ivory and cranberry cardstock, Designer Paper - Authentique, Stamping Bella - Minty Coffee, Verve-Glad Tidings, Spellbinders, misc buttona and twine. Summer is here.. finally. Happy Friday-it is time for a new challenge for Playing in Paradise and I am the hostess this week. Sunny days, warm nights, camp fires or beaches and probably a few bugs. I am pretty sure that most people try to do at least a small vacation in the summer, it may be a couple of weeks or just a weekend. I could happily plant myself in this picture, relaxing on the lake in one of these fabulous chairs. We had a slow start to summer so each warm sunny day is treasured. I love this designer paper, doesn't is just make you want to run out the door to enjoy summer. I colored Campfire Riley with my Tombow markers, the focal image and sentiment are edged with VersaColor Pinecone. 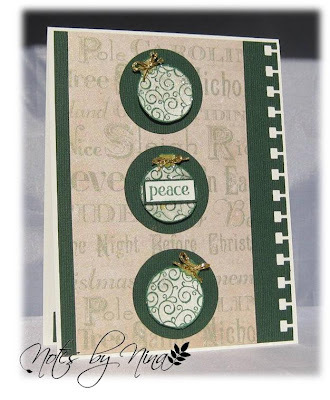 I used circle punches to create the embellishments and finished with Kaiser Craft Chocolate pearls. 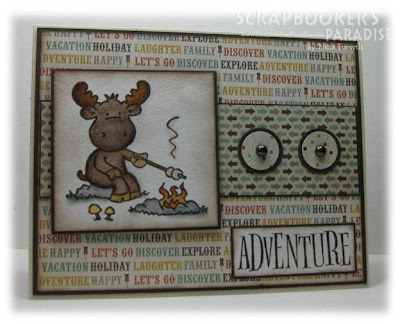 ﻿Supplies: Kraft and brown cardstock, Designer Paper- My Minds Eye, Campfire Riley, TPC – Adventure, Kaiser Craft pearls, misc punches. Thank you for stopping by, please visit the Playing in Paradise blog to see what the challenge team had created. I hid away in my craft room for a little while to see if I could manage a card this evening. My husband has been encouraging me to remember he needed a card for his sister's birthday :). I love the almost vintage look of this DP. I used co-ordinating paper for the squares and I secured the twine/ribbon with and old button . 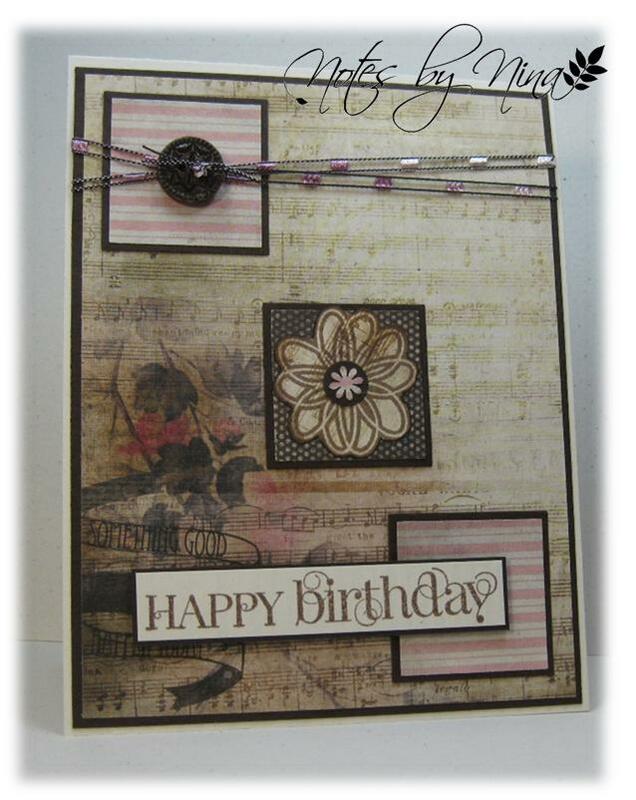 Supplies: Cream and Brown cardstock, Designer Paper - Glitz, Stampin' Up! 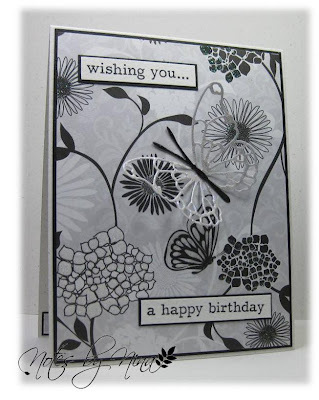 - Curly Cute, The Stamps of Life - Daisy, square punches, misc twine and button. Christmas in July, why not J. Although Lesley is taking a blog break for the month of July it does not mean the challenge can’t go on J so for this Monday I am going to use the sketch from Merry Monday #26. I wanted to make a CAS card for this week. Simple layers and I punched out this darling little girl who looks like she is cheering for winter J, I backed it with a scalloped circle. I finished with pearls and a sentiment. Supplies: Natural Ivory and turquoise cardstock, Designer Paper – October Afternoon, Verve-Christmas in the Air, misc punches and pearls. Happy Friday everyone, it looks like summer has finally arrived here in Victoria and the sunshine is wonderful. We have a new challenge for Playing in Paradise and Merle is our hostess this weekand the inspiration is Wedding or Anniversary. 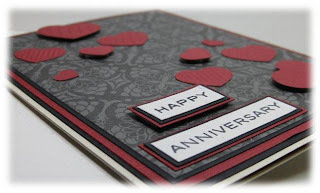 The theme for this weeks challenge is perfectly timed for me as it is my anniversary this coming monday and I created this card for my fabulous hubby. I think my card could pass for a Valentine's card too but a wise male cardmaker told me, 'don't use too many colours when making card for men, we just don't see them.' I don't really know how true that is but it seems to work well for my guy. I used lots of base layers to get nice frame appeal, then I added lots of little textured hearts. A few are popped up with foam tape to vary the effect. I tried to take a picture from an angle to see if I could capture the raised parts. I did same same with the sentiment with Happy popped up and Anniversay flush. 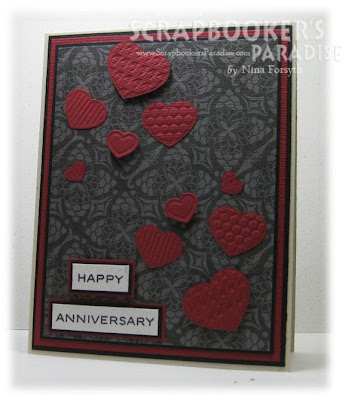 Supplies: Cream and red cardstock, Designer Paper-Momenta, Hot off the Press – Tiny Words, Sizzix - Embosslits Fashionable Hearts. It has been a long time since I have managed to get in on the Mojo Monday Challenge fun, but I did get a little craft time in this past weekend. I was following the sketch but it turned out little all over the place with my card, mostly because I glues some parts on upside down and the glue was dry by the time I figured it all out. 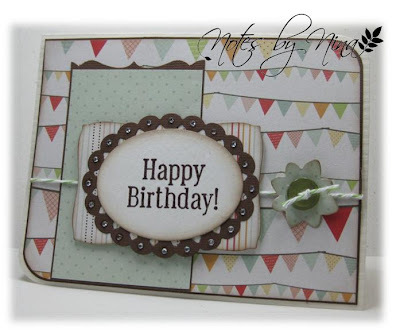 Supplies: Cream and Brown cardstock, Designer Paper –Echo Park, TPC – Happy Birthday, Spellbinders die cuts, twine and gems. 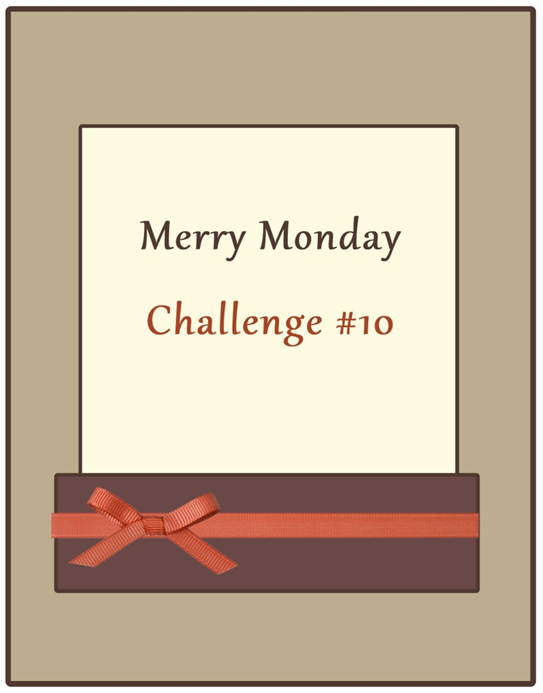 It is Monday and that means that we have a new and old Merry Monday Challenge. Lesley, wise lady that she is, will be shutting down her computer for July so this challenge will run long. We are going to choose our favorite Merry Monday Sketch and create something new. Old sketch, new card :). I am still going to try to create a Christmas card each Monday, I will have to see if I can manage it. After all it is summer and well.. there is just outdoor fun stuff to do. For my card this week I went back to the sketch from Merry Monday #17. I recently placed an order with Stampin' Up! and I could not wait to ink of the Happy Hour stamp set. I wanted my card to have a bit of a vintage feel, I used some new designer paper I received from Scrapbookers Paradise. I used Versacolour to add some colour to all my edges. 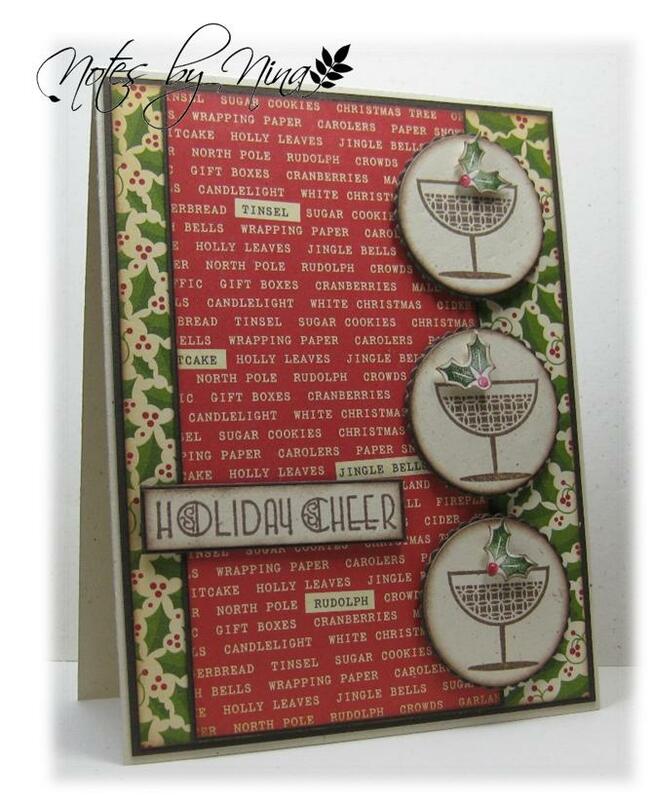 I stamped and cut out the little holly leaves for the drink glasses. I finished with a Holiday Cheer sentiment. 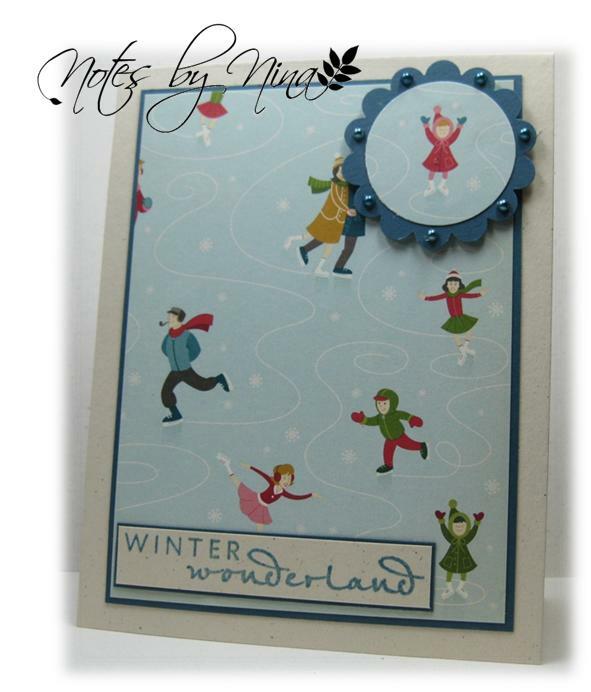 Stop by Lesley's blog to join in the fun and see what creations that design team has on display. I don't recall where I found the above image but I love the font.